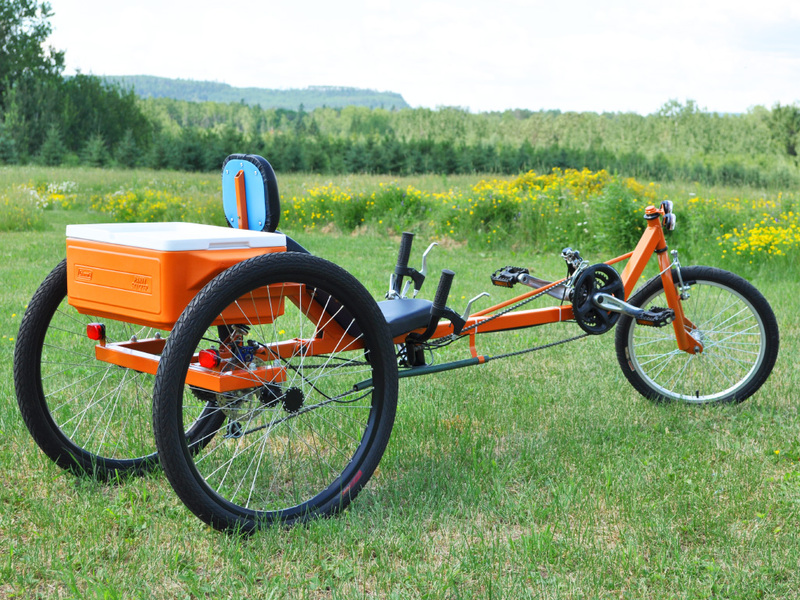 Build Your Own Delta Suspension Utility Trike. 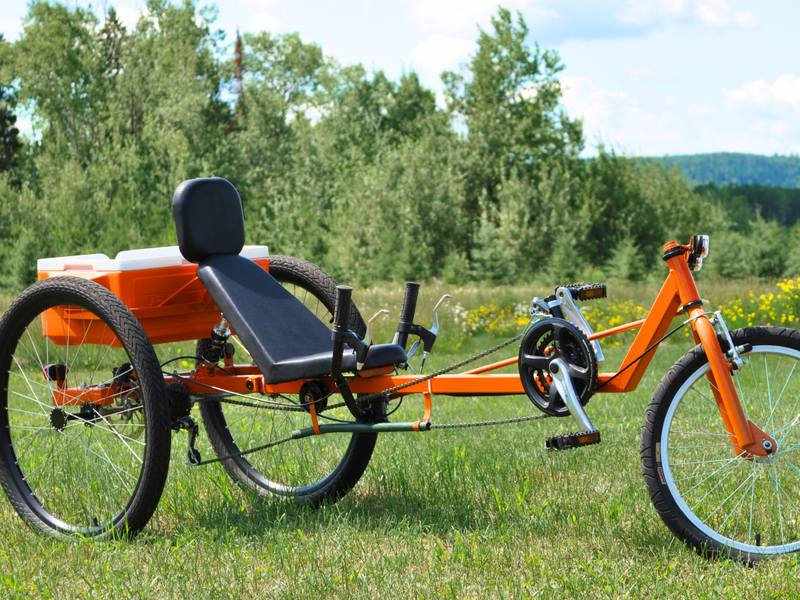 The TimberWolf Delta Recumbent Trike merges handling, and comfort and diversity into one great looking ride! With under seat steering, and rear suspension, you will be enjoying your laid-back country cruises or cargo runs in comfort and style. The TimberWolf is also a fun and nimble ride, with 26 speeds, great handling, and an earodynamic stance. A Delta Trike has two wheels in the back, with the front wheel placed ahead of the cranks. This design is considered easy to build, and lends itself well to all type of modifications. This trike also includes a cargo rack that is placed on the suspended side of the frame so that you can transport breakable goods safely. 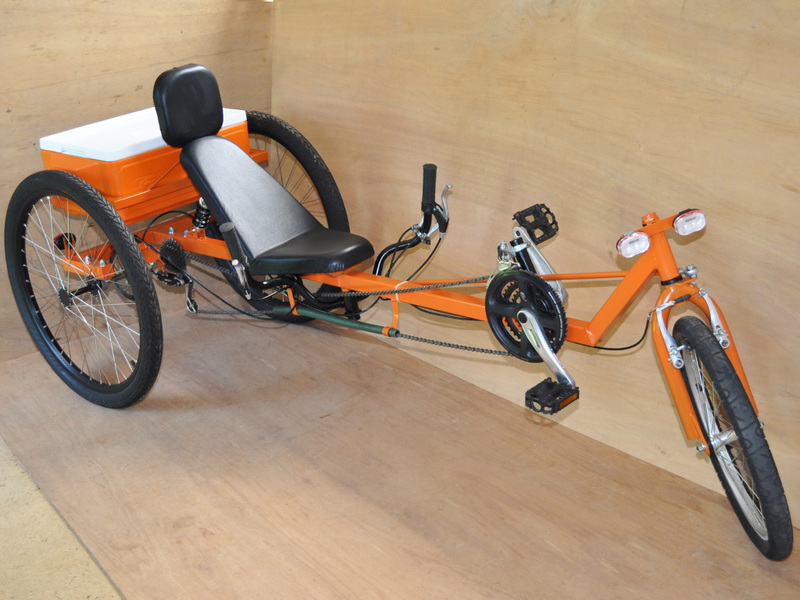 You Can Build This Trike Using Basic Tools and Parts. 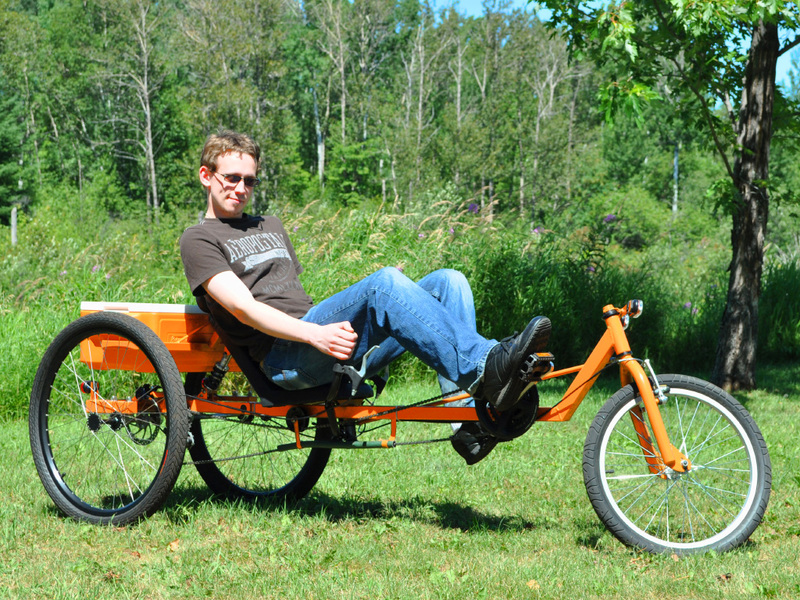 You do not need expensive tools or parts to build an amazing trike of your own. Most of the components used to build the TimberWolf can be taken from recycled bicycles or purchased from any hardware store. We only use basic hand tools and parts in all of our plans so that anyone with a desire to build something amazing can do so with minimal investment. The TimberWolf is the perfect mix of versatility and comfort, ready to move your groceries, take you to work, or just head out for a relaxing ride down some country road. The rear suspension will make your ride smooth and comfortable over any terain. Smooth Riding, Even With a Hundred Pounds of Cargo. The best description of the TimberWolf would be that it is the SUV of bikes, ready for any job. With the cost of gas ever increasing, it just makes sense to leave the car at home moe often and use your DIY trike to run errands and get around. The cargo space built into the TimberWolf can be completely customized to suit your needs, capable of carrying a hundred pounds or more. The rear suspension system is made using recycled mountain bike components, so there is nothing expensive or hard to find required. Every single step of the build is detailed with many photos, so you don't need any building experience. Looks Good, Rides Great, and Moves Your Stuff. The steering is positioned under the seat so that your arms are in a relaxed position as you ride. Recumbent trikes are a joy to ride due to the relaxed and comfortable position that also allows you to push hard when required. All shifters and levers are placed on the handlebars for easy access, and this trike is stable enough to ride with one hand holding a java on your way home. Welding the square tube frame is quite easy, only requiring the most basic welding rig and skillset. During the build you have plenty of oportunuty to modify the design to suit your own style and needs as well. Anything can be modified for a unique build. City Streets or Country Road, This Trike is great For Both. Trikes don't fall over, so they can be used on just about any kind of terrain from loose gravel roads to icy winter bike trails. You and your cargo are placed on the suspended side of the frame for optimal comfort and isolation from road vibrations. A rear disc brake and lever front brake provide plenty of stopping power so you can traverse those massive hills with ease, hitting decent speeds on the way doen. The chain is routed under the seat using standard hardware store pulleys, and all of the transmission parts are just standard bicycle components. Many of the required parts can be salvaged from a single mountain bike, with the other parts available at a bike shop. You Can Build a Unique Deltra Trike on a Minimal Budget. Your completed DIY Delta Trike will look as good as any commercially produced trike, but it will cost you a lot less. Even if this is your first attempt at making a bike or trike, you can certainly succeed with a little time and effort invested. Only common bicycle parts are used, and the main frame is made from basic steel square tubing. No experience is necessary. 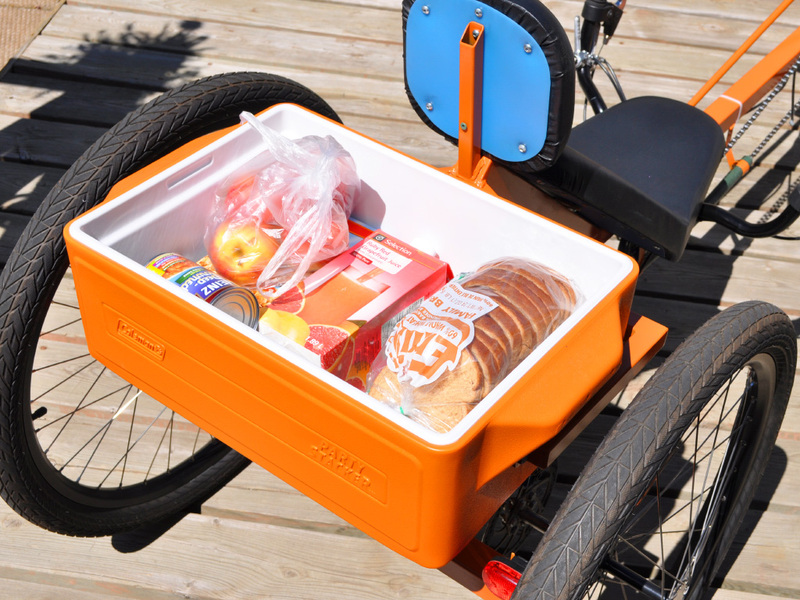 Add a cooler to carry your groceries, or perhaps you want to move a lot more, so a wood flat deck may be better. You are free to add whatever type of cargo carrying system you need, and there is plenty of room to make modifications to the rear of the frame. Your Cargo Will Enjoy a Smooth Ride. Drive over a curb with a dozen eggs in your grocery trunk, no problem thanks to the suspended rear cargo area. Perhaps you plan on commuting many miles per day and want to add a large battery pack. There is a lot of room at the rear to add a motor and battery as well. For those really wanting to move a lot of cargo, it is possible to lenghen the rear of the frame, or add a trailer hitch for extreme duty laod moving. Components like the head tube and suspension spring are just salvaged from an old mountain bike. You can also purchase all of your parts from any bicycle shop if you want all new parts, as they are fairly inexpensive and common. Run on Human Power For a Healthier Lifestyle! 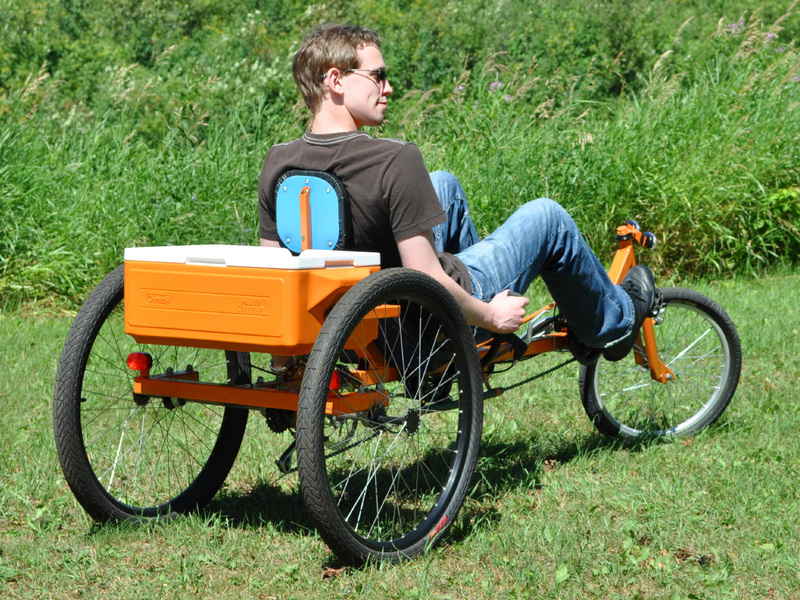 This DIY Cargo Trike weighs less than the spare tire on a pickup truck, but can do almost as much! Sure, it may take you a little longer to bring home your groceries under leg power, but you gain that time back by not needing a gym membership. 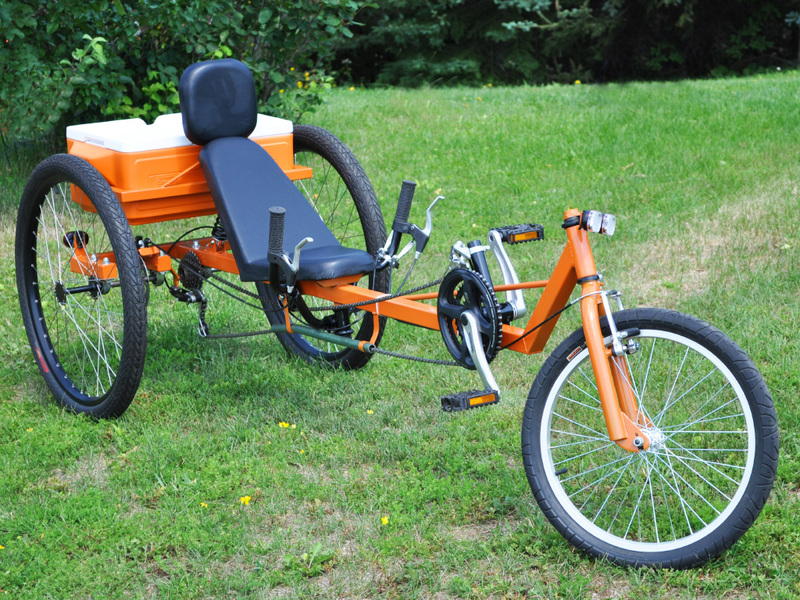 Leave the car in the driveway more often and improve your life by utilizing your own custom built DIY Delta Cargo Trike. The TimberWolf DIY Cargo Trike is built to last a lifetime, and is ready for any type of riding. 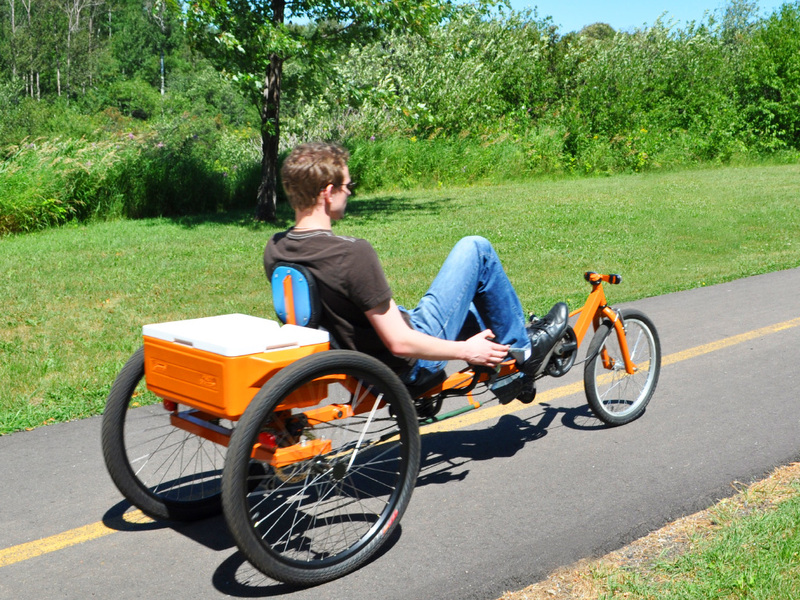 Enjoy the scenic view in a relaxing recumbent seat, or move your stuff on clean human power, getting a workout while your save a fortune on gas!